Demonstrating the time-proven performance of JBL loudspeakers across product lines for even the most demanding house of worship environments, Westbury National Show Systems installed JBL loudspeaker systems at the Richmond Hill Chinese Community Church as well as the Scarborough Chinese Baptist Church, both located in Ontario, Canada. The installation at Richmond Hill was part of an extension to the existing facility, with the addition of a 1,600-seat worship sanctuary, while the installation at Scarborough was part of a brand-new, uniquely designed church with a sanctuary capacity of 1,000 people. The Richmond Hill Chinese Community Church features a main PA system that includes a center cluster of three JBL PD5322/43 loudspeakers, which are hung above the main stage area and include a JBL PD5322/64 loudspeaker on each side. Westbury also installed two JBL VPSB7118 subwoofers in the stage. There are eight AC2212/64 loudspeakers installed in the over balcony area and eight MS28 loudspeakers installed in the under balcony area. The system is complimented with a choir fill system containing three JBL AC2212 loudspeakers that are located behind the main center cluster. The driving forces behind this extensive JBL system are Crown CTs series amplifiers. Three CTs2000 amplifiers are driving the high fills while five CTs3000 amplifiers are driving low fills. 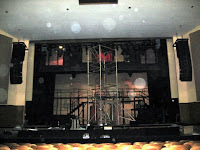 Four Crown CTs1200 amplifiers drive each of the over- and under-balcony loudspeakers respectively. Two CTs6000 amps power the high fills for the choir and two CTs1200 amps power the low fill. The audio distribution is done from the front of house console through four BSS Soundweb BLU 80’s and three BLU 32’s. The brand-new Scarborough Chinese Baptist Church is a uniquely designed church with a long stage and four seating sections that accommodate a total of 1,000 people. Westbury National Show Systems installed an audio system featuring a left/right setup containing two JBL VP7315/64 loudspeakers and one VP7215/95 loudspeaker on each side. Each cluster also includes one VP7212/64 for stage fill and two SB7118 subwoofers that is hung from the ceiling. For more information on Westbury National Show Systems, please visit www.westbury.com. JBL is a unit of Harman International Industries, Incorporated (www.harman.com). Demonstrating the weather durability and output capability of JBL Professional’s Precision Directivity (PD) Series and Application Engineered (AE) Series loudspeakers, systems integrator C.V. Lloyde Music Center utilized WRX weather resistant versions of these speakers in a new scoreboard loudspeaker system at the University of Illinois Memorial Stadium. Home to the University of Illinois football team, Memorial Stadium now holds more than 65,000 fans after renovations over the past few years. Demonstrating the rising global popularity of JBL VERTEC® line arrays for the world’s most challenging live-performance events, Brazil-based Gabisom Audio Equipment provided a massive VERTEC line array system at Rock in Rio, the world’s largest music festival. The first in two series of shows, Rock in Rio Lisbon featured performances by Lenny Kravitz, Bob Dylan, Bon Jovi, Metallica, Rod Stewart, and Linkin Park. The second series of shows in Madrid featured Bob Dylan, Franz Ferdinand, Chris Cornell, Neil Young, Shakira, The Police, and Amy Winehouse. In both locations, Gabisom deployed a JBL VERTEC system with four array locations for the main (World Stage) system. A total of 120 VT4889 large-format line array elements and 60 VT4880A Ultra Long Excursion subwoofers were deployed in the main suspend arrays. The main system consisted of four arrays across the front in the normal L/R (front), LL/RR (outfill) configuration. In a unique twist, however, each array consisted of three separate hangs: dual VERTEC VT4889 full-range hangs, separated by a VT4880A subwoofer hang in the middle. The main left and right arrays had two columns of 18 VT4889 line array elements and one column of 18 VT4880A arrayable subwoofers each. Outer LL and RR columns had two columns of 12 VT4889 elements and one column of 12 VT4880A subwoofers. Each group of the three arrays was driven by three separate signals called Band, Vocal, and Sub. This assisted in creating sound that was portrayed by system operators as effortlessly powerful and clear in a festival where the sheer size of the venues demanded something beyond the standard PA.
Showcasing the quality, ease of use and reliability of the Studer Vista 5 SR console, Clair Showco of Lititz, PA, recently provided the audio system for country music star Keith Urban’s U.S.-based tour. The multi-city tour featured Studer Vista 5 SR digital audio consoles in use for both FOH and monitor mixing applications. Taking both the Australian and U.S. country music scenes by storm, the New Zealand born Urban heavily relies on the sound quality of the Vista 5 SR while on tour. The Studer Vista 5 SR was chosen by his mixing engineers who went through a vigorous evaluation process prior to the selection of the console but chose the Studer after it met all required criteria: Sound quality, flexibility/ease-of-use and reliability. FOH Engineer Steve Law and Monitor Mixing Engineer Jason Spence evaluated numerous brands of sound consoles before the tour. Spence noted he had never felt as comfortable with a new desk as he did during the week he was trying out the Studer Vista 5 SR.
"When choosing a console, I have three criteria," said Spence. "It has to sound good to the artist on stage! If it doesn't, there's not much point in continuing. Second, I have to be able to get around it quickly. With the 'inline design' of the input and output strips, the Vista 5 SR feels very 'analog.' I'm able to have control and access to all the parameters at my fingertips. There are not multiple pages to plow through to gain control of any particular feature. Lastly, it needs to be reliable and not crash. It seems that with other brands, I could get one, maybe two of my criteria met; however with the Studer, I got all three!" Additionally, Crown Macro-Tech 3600 amps and a Lexicon M480L Reverb Effects Processor were in use as part of Clair Showco’s custom JBL-loaded loudspeaker system for the Keith Urban tour. Clair Showco can be reached at www.clairshowco.com. Hitachi Home Electronics (America), Inc., Business Group has appointed Annie Sunseri as Northeast regional sales manager. Ms. Sunseri brings over 15 years experience in sales and marketing, most recently as an independent marketing consultant advising clients in event marketing, channel marketing, channel development and non-profit event management. Ms. Sunseri previously served as the senior marketing events manager for InFocus Corporation, a digital projection company. In this role she developed all corporate marketing, sales and reseller/vendor partner events and tradeshows. Ms. Sunseri’s responsibilities will include generating sales of Hitachi LCD projectors to dealers that serve various markets throughout the Northeast, including education, houses of worship, government, corporate and SOHO/home office. Because of their ease of installation, intuitive operation and affordability, Hitachi projectors offer the lowest cost of ownership in the industry. Hitachi Home Electronics (America), Inc., Business Group has announced the appointment of Ray Soltys to the position of Director of Sales, Business Group, effective immediately. Mr. Soltys will be responsible for sales of Hitachi LCD projectors and Hitachi Software interactive panels and whiteboards. Mr. Soltys has been with Hitachi since 2000, advancing from regional sales manager to become national sales manager in October 2002. During his time with Hitachi, Mr. Soltys has contributed significantly to the company’s continued position as the leading projector manufacturer in the pro A/V industry, while helping expand sales to Central and South America. Demonstrating the industry-leading sound, reliable coverage characteristics and easy setup features of JBL VERTEC® line arrays, more than 67,000 fans flocked to Roskilde, Denmark this year to witness Roskilde Festival 2008, the largest annual rock music festival in Northern Europe. This year’s Roskilde Festival featured performances by Radiohead, Neil Young, Gnarls Barkley, My Bloody Valentine, Jay-Z and many more. DPA Soundco A/S of Soborg, Denmark, once again provided concert sound services for the legendary festival. A total of 60 VT4889 full-size line array elements were suspended using ground-support trussing structures which flanked the festival's unique, orange tensile-membrane outdoor stage covering. Each main left/right array included 18 VT4889's, supplemented with out-fill array hangs of 12 boxes each. DPA Soundco’s Paul Hammann and Claus Pedersen headed the onsite crew responsible for system deployment and operation. "This is the first year we have deployed JBL's VERTEC system for Roskilde, after using another system for many years," advised Sten Jensen of DPA Soundco. "The large VERTEC system went up very quickly. We relied on JBL's new V4 DSP presets and found that we did not have to use very much EQ on the system. The long-throw capabilities were as expected, so some additional delay arrays that had been provided on towers at 50 meters (164 feet) out from the stage were more to bring in some additional high-frequency energy than for providing any additional output power, as there was a constant headwind of up to 8-12 meters per second [18-27 miles per hour]." JBL VT4888 midsize line array elements were used to cover areas close to the stage. "The front fill system that we had designed for the event worked well for the audience pits in the middle, intended for a throw out to about 25 meters from the stage," explained Jensen. "Each year we make gradual adjustments and improvements to the overall sound system, and we already have ideas for refining our approach for next year." Jensen noted that the sound crew and guest engineers were very pleased with the overall results. "We were especially happy with summation of the main and the offstage VERTEC array hangs. And, we were able to get perforated net in front of the offstage speakers (rather than solid plastic) so this was a help," he observed. "All in all we were quite pleased with the performance of the system. We think that VERTEC will experience a second wave of interest and excitement in the industry, with JBL's new V4 DSP presets." Underscoring its commitment to engineering education and reaffirming its support of the Audio Engineering Society (AES), AKG provided two of the top performing students in the 2008 Annual Student Competition of the AES Convention with microphones and headphones as prizes for their academic achievement. The 2008 competition, held last month at the 124th Convention in Amsterdam, the Netherlands, featured the largest number of student participants to date. Two top performing students were issued a pair of AKG K271 Mk2 headphones and an AKG C 214 microphone for their accomplishments. David Schwager, of The University of Applied Sciences in Dusseldorf, was granted an AKG C 214 microphone for Non-Classical Surround, while Marcin Szwajcer of the Wroclaw University of Technology, received a pair of AKG K271 Mk2 headphones for finishing second at AES for World/Folk music. AKG K271 Mk2 are dynamic, around-ear, closed-back headphones that are designed for playback recording and live monitoring applications. Offering a stage blue color and superior performance, the K271 Mk2 is also equipped with an additional five meters of coiled cable, comfortable leatherette and velvet ear pads. AKG’s brand new C214 microphone captures sound using a one-inch diaphragm with patented Edge-Terminated Back Plate Technology providing wide frequency response. Additionally, the microphone offers a –20 dB Attenuation pad, 13 dB noise floor, and a low cut switch-all in an elegant but rugged package. Additional features include an integrated suspension, a double mesh grill, and a switchable low cut filter. System Featuring JBL Professional VERTEC® Loudspeakers, Crown I-Tech Amplifiers, Soundcraft Vi4 Mixing Console Joins The Cast At Hitmaker High School. As the sound system provider of choice to some of the world’s most high-profile concert tours, the most successful blockbuster movie presentations and the most prestigious recording studios, it is only fitting that the Harman Pro Group was selected to provide components for a brand new PA system for the 1000-seat auditorium at Hollywood High School, a veritable star-making machine that has earned a far-reaching reputation for its remarkably progressive and prolific drama program. The sound system was designed and installed by Richard Ralke, President of L.A. Sound Company in Canoga Park and features JBL Professional VERTEC® line array loudspeakers, Crown I-Tech amplifiers and a Soundcraft Vi4 mixing console. The alumni rolls from Hollywood High School reads like a Who’s Who of movie history. Former students include screen legends like Mickey Rooney, James Garner, Judy Garland, Keith and Robert Carradine, Sara Jessica Parker, Lana Turner, John Huston, John Ritter and Laurence Fishburne. The school is located between Hollywood Boulevard and Sunset Boulevard and is a fixture in a Hollywood landscape that includes other iconic Harman Pro Group installations including Mann’s Chinese Theater, Walt Disney Concert Hall, the Kodak Theater, the Samuel Goldwyn Theater, The National Academy of Recording Arts & Sciences (NARAS), The Directors Guild Of America (DGA) and the Alfred Hitchcock Theater. In addition to its star-studded alumni, the school has also hosted concerts for The Byrds, Elvis Costello and the Stone Roses among others. The system comprises 14 JBL VERTEC VT4887A compact line array elements with four JBL VERTEC VT4881A arrayable subwoofers. The system includes a Soundcraft Vi4 mixing console, and amplification is provided by 8 Crown ITech 4000s for the line arrays, 1 Crown ITech 8000 for the subs, 4 Crown XTI 4000 for stage monitors and 1 Crown CDI 1000 for dressing room and backstage. The audio package reflects the standard equipment riders of touring concert acts like Bruce Springsteen, Blue Man Group, Gwen Stefani, Nine Inch Nails, Toby Keith, Neil Diamond, Lenny Kravitz, Rascal Flatts, Josh Groban, Seal, Eric Clapton, and many others whose rental system suppliers take to the road with similar gear. L.A. Sound Company, founded in 1971 by Richard Ralke, has evolved from being a regional tour company into a full service corporate and concert system provider, system designer - integrator and pro audio retailer. The company has become a fixture on the Hollywood scene and has earned a reputation for excellent sound coupled with personalized service. Locally, L.A. Sound Company is supported by Harman Pro Group sales representative Dave Kaiser of Sound Marketing West. Mixers from both Studer and Soundcraft appear at numerous events and broadcast facilities at the Beijing 2008 Olympic Games. Digital consoles from both Harman companies have been chosen and purchased by local Chinese broadcasters as well as worldwide companies who are installing or providing facilities at the events. The increased attention to HD broadcasting and surround has been one of the reasons Studer consoles particularly have been bought by numerous Broadcasters for their games coverage. By far the largest consumer of Studer consoles for the games is China’s premier Broadcaster, CCTV (China Central Television). Their English-speaking International channel, CCTV-9, is using a Studer Vista 7 in its on-air studio, while the main studios of CCTV have been equipped with four Vista 5’s and five OnAir 3000’s. Quindao Radio has purchased an OnAir 3000 for the games, and Hong Kong’s TVB has purchased a total of five Vista 5’s, three for its studio for the games and two for OB vans. Studer Vista consoles are particularly popular in OB vehicles because of their compact size, weight, simple user interface and functionality (including surround management and integral Dolby E and SDI decoding capabilities), and local broadcasters Guangdong TV, Beijing TV and Shanghai Media Group all feature Vista 8’s in their trucks. The Shanghai Media Group also fitted a dedicated 5.1 audio truck with a Vista 5. CCTV’s HD OB van is equipped with a Vista 8 and an OnAir 3000, while TJTV’s HD truck is now equipped with a Vista 8. HLJTV’s HD van comes with both a Vista 5 and an OnAir 3000, BTV’s HD truck is fitted with a Vista 8 and an OnAir 3000. Jinan TV and Dalian TV are sending HD trucks, both fitted with Vista 5 consoles. From outside China, Spain’s TVE is constructing its own studio in Beijing, where three Studer Vista 5’s handle all the mixing tasks, as will the Vista 5 in the studio of Hungary’s MTV. Danmarks Radio’s facilities include a Studer OnAir 3000 (the corporation operates some 90+ Studer OnAir mixers in Copenhagen), and an OnAir 3000 will be at the heart of Brazil’s TV Bandeirantes’ system, while OB vehicles from France (SFP and VCF) and Norway (NRK’s HD-1) will run with Studer D950’s, Vista 5’s and Vista 8’s. Finally, the OnAir 3000 infrastructure of the Swiss SRG Media Services (MSC) will also be in Beijing, feeding all the radio programs of SRG, 13 networks in all. For the opening and closing ceremonies, Soundcraft Vi6™ digital consoles are part of a large Harman-based system, while a Soundcraft Vi6 is at the heart of the system in the National Aquatics Centre. Two Soundcraft Vi4™’s are installed at the National Olympic Conference Centre, and numerous Soundcraft analogue mixers ranging from CompAct mixers up to MH4’s are installed in Olympic venues such as the Fengtai Softball Field, Chang Ping Indoor Stadium, Olympic Sports Centre Gymnasium, Beijing Foreign Language University Stadium, Ditan Park Indoor Stadium, Shanghai 80k Stadium, Hong Kong Equestrian Venues and the Honk Kong Olympic House Conference Room. Front of House Engineer Jon Garber and monitor engineer Stuart Delk discuss how the Studer Vista 5SR Digital Console has made the Rascal Flatts "Still Feels Good" tour such a major success.